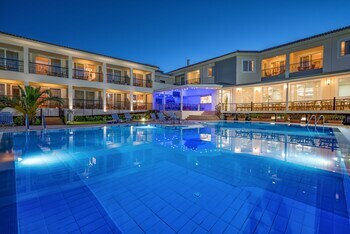 Located in Zakynthos, Park Hotel & Spa is a 5-minute drive from Tsilivi Beach and 8 minutes from Dimokratias Square. Featured amenities include a computer station, a 24-hour front desk, and luggage storage. Free self parking is available onsite. Located in Rhodes, Stegna House is by the sea, within a 15-minute drive of Stegna Beach and Archangel Michael's Orthodox Church. Free self parking is available onsite. With a stay at Hera Studios in Chania (Chania Town), you'll be a 3-minute walk from Chania Lighthouse and 9 minutes by foot from Venetian Port. The front desk is staffed during limited hours. With a stay at Esperides Maisonettes in Aegina, you'll be 29.7 mi (47.8 km) from Port of Piraeus and 30.5 mi (49 km) from Karaiskaki Stadium. Located in Santorini, Dantelo Luxury Residences is within a 15-minute drive of Museum of Prehistoric Thira and Archaeological Museum.